Drowning in a sea of bubblewrap as I get everything wrapped up ready to take down to Harrogate on Saturday! I’ve spent an enjoyable day deciding on just how I want to display everything. Pleasantly surprised to discover that I do have enough work to fill my 2 x 1 m shell space. I know this because I mocked up the show in my, almost, 2 x 1 m bay window !! There’ll be some jiggling and adjusting but I’ve got an idea now, and in the shell space I’ll have a bit more height so things will have a bit of breathing space. I’m glad I didn’t go for the additional storage unit – there’s no room!! I did spend/waste quite a lot of time finding the fishing line that I use to find work – why did it take so long to find? Because it was in my exhibition tool kit/vanity case – where it was meant to be but obviously the LAST place I looked for it! The wholesale price lists, labels and bio are typed up, printed off and mounted on foam board. I’ve still got a whole day to finalise things so I’m feeling quite calm – which feels quite odd! I’m very grateful to Heaton Baptist Church for the loan of one third of the ‘My Journey’ triptych, and to St Bede’s Palliative Care Unit for the loan of one third of their triptych. I wanted to show community projects alongside my fine art textiles work, and that Heaton Map is just too darn big! (All of these pieces can be found in earlier blog posts). Just borrowing it for a few days! The rest of the show will be made of recent work and a few old favourites, as I want to give a flavour of everything that I do. So now its time to pack the tool kit, the step ladders and my trusty flask, and some smart clothes! I’ll try and do an update whilst I’m at the show..see you in a few days! This entry was posted in art exhibition, artwork, British Craft Trade Fair, commission, community project, craft workshops, Selected Maker Awards 2016, textile art, Textile gallery and tagged art, Arts, artwork, craft, Exhibition, gallery on March 31, 2017 by donnacheshiretextiles. Gallery 45 is a gorgeous venue in Felton, Northumberland. From Saturday, the gallery will be holding the latest exhibition of Textile Art made by members of the Fusion Textile Artists Network. The exhibition is called ‘Connections’. The theme has been freely interpreted by the members of the network, so there will be a wide range of subject matter and textile processes to view. We spent a weekend working with Textile Artist Shelley Rhodes in the Long Room at the gallery last Autumn. Some of the pieces in this new exhibition have developed from that workshop. The work will be exhibited in the main gallery and in the Long Room and will be on display from March 4th until May 5th. There will be an opening event where you will be able to meet some of the artists this Saturday, 4th March, from 11am – 1pm – refreshments will be available! The gallery itself is open from 10 – 5 Tuesday to Saturday and 11-4 on Sunday. For my part, I’ve been exploring the connection one feels with the landscape; how that natural space can be healing and soothing. I love the feeling of being somewhere that is so open, beautiful and powerful. The landscape precedes us and will continue long after we are gone. There is much research to show that connecting with nature is beneficial to our health and well being. I have been visiting and recording the landscapes of Northumberland and Scotland and it is this work that I will be including in the exhibition. Donna Cheshire – Glen Rosa;Swirling thoughts, tumbling water, 2017. All the pieces are created using hand coloured fabrics and free machine embroidery. It is quite a slow process but it encourages contemplation and I like the painterly effect it achieves. As part of the exhibition programme, I will be running my Tin Can Metamorphis Workshop on Saturday 25th March. If you’d like to come along to this please contact the gallery direct! This entry was posted in art exhibition, artwork, craft workshops, Selected Maker Awards 2016, textile art and tagged art, artist, artwork, cake, embroidery, Exhibition, gallery, landscape, sale, stitch, textiles, weekend, workshop on February 28, 2017 by donnacheshiretextiles. Something Fishy & All things Holy (T)! Getting ready for tomorrow’s workshops- blanks cut and painted ready for participants to add their creativity! Some of the demonstration pieces will be for sale at the Holy T Art Fair – to raise funds for the project. See you there 23/24 September!! And this view of Holy Isle should be framed and ready to go too! 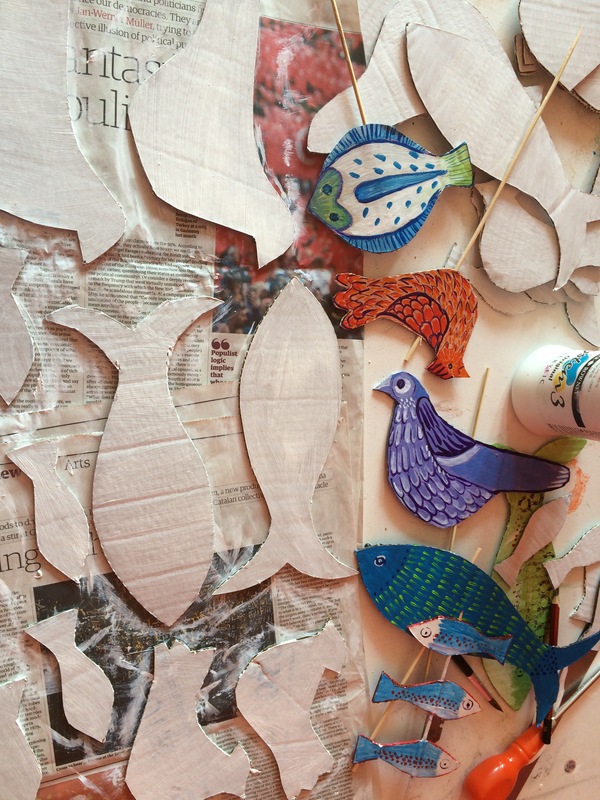 This entry was posted in art exhibition, artwork, community project, craft workshops, North East Coast, seasonal, Selected Maker Awards 2016 and tagged art, Holy Isle, painted fish, textile art on September 13, 2016 by donnacheshiretextiles. Tomorrow is delivery day for the Great North Art Show!! So my bank holiday is being spent adding mirror plates and searching for bubble wrap! I’m taking five pieces to the show – but I think one of them is still in Edinburgh so there may have to be a last minute substitution…. Sometimes the sun breaks through the clouds. (I’ve just had this one re-framed and added in some sneaky extra details! Can you spot the difference? There’ll be some more images soon of the show itself, I’m so looking forward to it! This entry was posted in art exhibition, artwork, embroidery, North East Coast, seasonal, Selected Maker Awards 2016, Uncategorized and tagged art, artwork, British Summer, embroidery, Exhibition, gallery, Great North Art Show, textile art on August 29, 2016 by donnacheshiretextiles. Surging towards a market next Saturday 28th May – Newcastle ArtsFest organised by the Lovely Lesley! My ‘transport co-ordinator’ loves it because he gets to drive up to Gray’s Monument in Newcastle city centre! So, I’m busy finishing some new pieces and planning the set up. It’s always lovely to be in the centre of Toon, lots of people to chat too and lots of lovely artwork to admire – get yourselves there if you’re in the area! These two are awaiting their frames, the weather has turned a little stormy! I’ve been developing ideas with my hand dyed fabrics, trying to emphasise mood and texture. Meanwhile, it’s all a bit shipshape at the Arts in Health project I work on too – this time its all about boats. Those owls we made are lovely but maybe a bit Autumnal? So I thought we could all sail away on a seaside theme over Summer, redoing our window display with a new installation. One relative on the Chemo’ ward kindly donated some old map books, so the pages are going to be repurposed as sails. I have sterilised lots of bits of driftwood and disassembled a roll of willow edging (Poundland !) 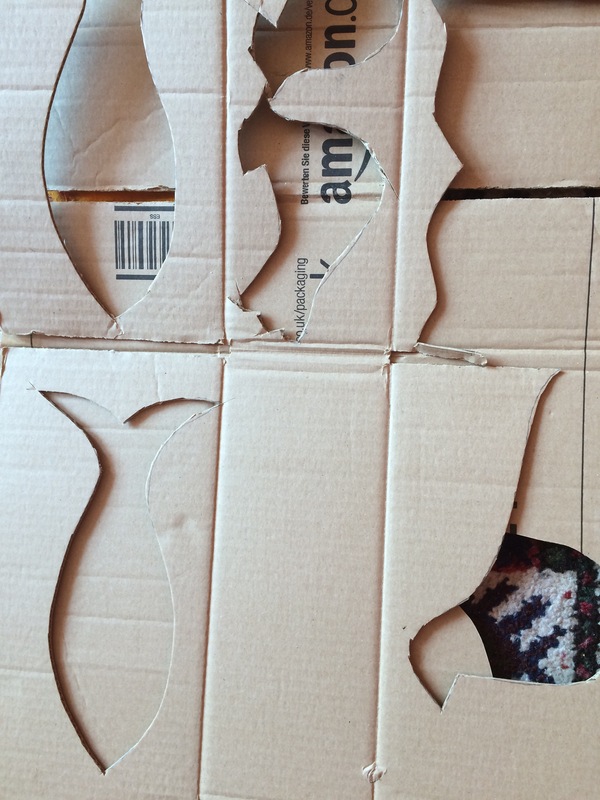 So this week we’ll be making driftwood boats to sail over the seven seas. Then we’ll add needle-felted lettering across the top of the scene and a silk painted ocean at the bottom. That should keep us all busy for a few weeks! 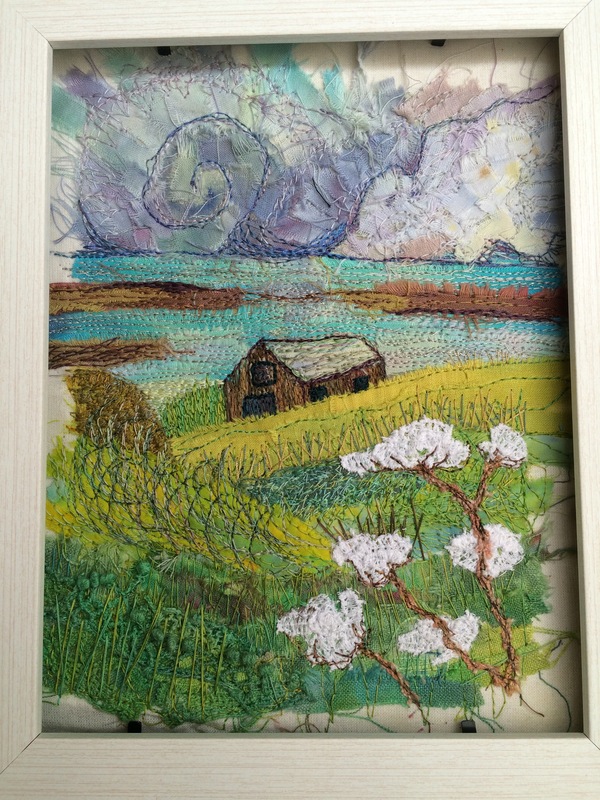 This entry was posted in art exhibition, artwork, community project, craft workshops, North East Coast, seasonal, Selected Maker Awards 2016 and tagged applique, artwork, British Summer, embroidery, machine embroidery, recycle, seaside, textile art, workshop on May 24, 2016 by donnacheshiretextiles. I know it doesn’t take much to distract me but…! So, a great big thank you to everyone who voted for me and to the judges for appreciating the importance of personal and community making in my work. And now I’m in need of a celebratory cup of tea! This entry was posted in artwork, commission, community project, craft workshops, embroidery, Selected Maker Awards 2016 and tagged applique, machine embroidery, prize winning textiles, textile art on April 30, 2016 by donnacheshiretextiles. Room for You – Exhibition Time!